Michelle Obama's sweet birthday tribute to her mom is melting the internet's hearts. We all know Michelle Obama as an awesome mom, but she's not letting anyone forget about her awesome mom. 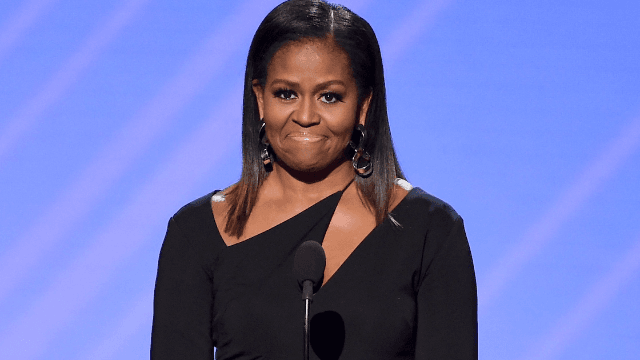 Obama's mother, Marian Robinson, celebrated her birthday this weekend, and Michelle's tribute to her has the Twitter-sphere getting a tad emotional. On Saturday night, the former first lady posted a sweet birthday message for her mom to Twitter, along with an old photo of the two of them together. "Happy Birthday Mom!," Obama wrote in her tweet. "Your unconditional love has made me who I am today. You are my rock. My [heart]. I'll always be your Miche. I love you." Michelle's touching tribute melted the hearts of the internet, and made many people nostalgic for the days the Obamas were in the White House. You are missed. Your family is missed. Class in the oval office is missed. Does Sasha sure look like you! Your grace, brilliance and thoughtfulness are so missed. You guys are loved! Thank you for all you did. Twitter just has a lot of feelings about this, okay? Happy birthday, Mrs. Robinson!